← Formation of Red Lights Photographed. Strange White Mass Captured on Security Camera. Strange Anomaly Appears in Security Camera Video. 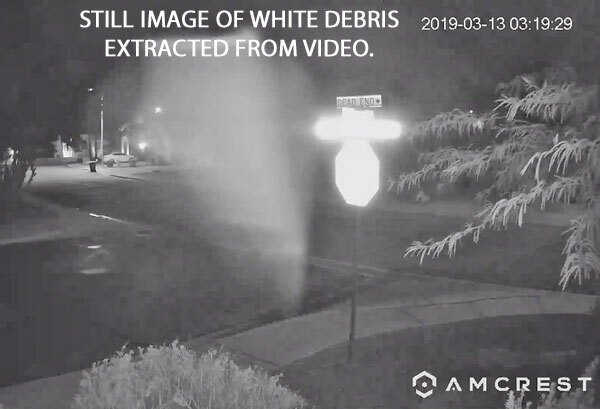 STILL IMAGE OF WHITE DEBRIS EXTRACTED FROM VIDEO. Description: I am wondering what this is? It was captured in front of my house. Note: The anomaly is probably some type of debris that was blown onto the camera lens cover. The video clearly shows that there was some wind. This entry was posted in Discovered anomaly in video, Photos, Strange Shaped, UFO Sightings 2019, UFO Sightings Arizona, Video Clips and tagged White. Bookmark the permalink.